Publimetro: GreenTech Automotive company is under investigation. GreenTech Automotive company is under investigation. Amid probe,car company's plans haven't panned out. Electric car startup stalls amid probe. When GreenTech Automotive launched its electric car venture, it drew enthusiastic support. Now, the company is under investigation, and its land sits empty. Electric cars: Xiaolin Wang, president and chief executive officer of GreenTech Automotive, shows off three prototype cars. TUNICA, Miss. — Four years ago, a startup car company announced with great fanfare big plans for the Mississippi Delta: Using money from foreign investors and other sources, it would build a massive auto plant to churn out a new line of energy-efficient cars and bring thousands of jobs to the area. It seemed like a win for everyone involved. The foreign investors who plunked down at least $500,000 for the venture would get the opportunity to stay in the United States and a path to citizenship, an impoverished area of Mississippi would get some desperately needed jobs, the state would generate tax revenues, and the political leaders involved would be able to tout job-creation prowess. Today, the place where the plant was to be remains mostly vacant except for a temporary construction trailer. The company — GreenTech Automotive Inc. — is under investigation by the Securities and Exchange Commission, and the probe is reverberating well beyond Mississippi's borders, bringing scrutiny to a Virginia gubernatorial candidate and the company run by the brother of former Secretary of State Hillary Rodham Clinton. "Back in 2009, it was a big deal," said 21-year-old casino employee Perry Turner, who lives across the highway from GreenTech's mostly empty site in rural Tunica County. "I haven't heard much else about it." Some analysts say it was a risky business plan and foreign investors may have been more interested in an easy way to get a visa and a chance at citizenship than trying to support a venture that had a good chance to turn a profit or create jobs. In October 2009, GreenTech's owner, Chinese businessman Xiaolin "Charles" Wang, unveiled four prototype cars during a flashy ceremony and promised to build a $2 billon plant in the heart of the Mississippi Delta. A worker walks across the site of what is believed will become the manufacturing facility for GreenTech Automotive in Tunica, Miss. Besides backing from foreign investors, some 100 acres were donated by Tunica County's economic development foundation, at a cost of $1.8 million, and in 2011 the state gave a $3 million loan toward site preparation. For a time, the company's chairman was politically connected heavyweight Terry McAuliffe, a close adviser to both former President Bill Clinton and his wife, a former Democratic national chairman. McAuliffe is now a contender for Virginia governor. The cars were supposed to start rolling off the assembly line in 2012. The company now hopes to start producing cars next year. And while they say they still plan to build a plant in Tunica County, all that was on the land on a recent afternoon was a construction trailer, a few pieces of equipment and a few workers strolling around. The company instead now uses a former elevator factory 30 miles away in Horn Lake. 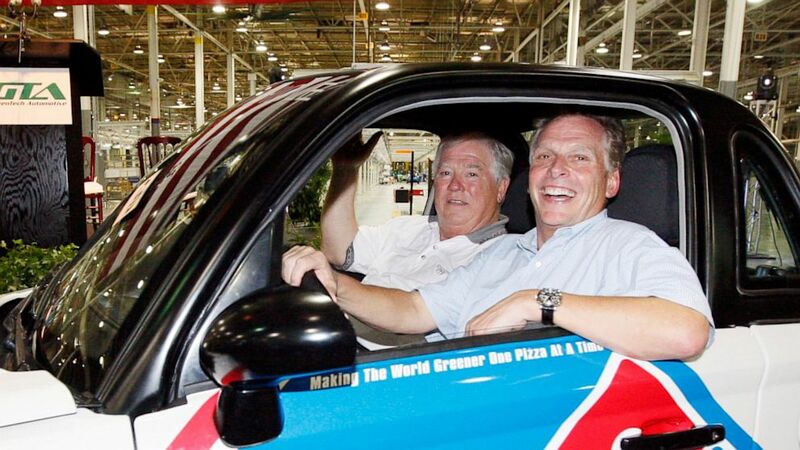 A McAuliffe spokesman said about 100 small electric vehicles were built by the time McAuliffe resigned from the company in December. The thousands of promised jobs have yet to materialize. The company said it has more than 100 workers and "once production is ramped up" should employ at least 350 — the same number of jobs required under the state loan agreement. Jeff Rent, a spokesman for the Mississippi Development Authority, said the company has assured the agency they're on track to meet hiring goals. Industry analysts say the company faces hurdles to succeed. "A brand-new electric car company without an established U.S. partner, or global partner, is a lofty goal," said Joe McCabe, president of AutomotiveCompass, which forecasts global vehicle and power train production. "They're one of several other electric manufacturing startups entering a tough market. They have to come with something better to the game, not just an also-ran." Other analysts say GreenTech exposes problems with a program used to attract foreign investors — known as the EB-5 visa program. David North, a fellow with the Center for Immigration Studies, a nonprofit based in Washington, D.C., that examines immigration policies, said the foreign investors in the EB-5 program are primarily motivated by a desire to get green cards for them and their families, not to find lucrative propositions. "So this EB-5 program by its very nature is often linked to second- and third-class investments," he said. Under the EB-5 visa program, foreigners can invest $500,000 or $1 million in American business ventures depending on the location of the project. In GreenTech's case, the program called for $500,000 investments. The EB-5 program is capped at 10,000 investors a year, and had 6,106 applicants in 2012. Under the rules of the program, each EB-5 investment must create at least 10 jobs. In exchange, the foreign investors get to stay in the United States for up to two years and can then apply for full citizenship, a speedier process than afforded to most other immigrants who must wait five years after establishing residency before being eligible for citizenship. The federal U.S. Citizenship and Immigration Services' Immigrant Investor Program also designates so-called "regional centers," companies that have authorization to handle the company's EB-5 investments — and can collect thousands of dollars in fees from foreign investors to process their visa applications. In this case, Gulf Coast Funds Management — a company headed by Tony Rodham, Hillary Clinton's brother — is the designated "regional center" and has raised 45.5 million from foreign investors for GreenTech, according to an internal immigration services document obtained by The Associated Press that outlines background information about the firm. Rodham has not responded to phone messages at Gulf Coast Funds or a message sent to an email address listed in government reports submitted to the government. Hybrid Kinetic Motors, a predecessor to GreenTech, paid Gulf Coast $250,000 for assistance in setting up the EB-5 program, according to a lawsuit between Wang and his former partner. Regional centers collect additional fees for processing the investments. Of GreenTech's 91 foreign investors, only one has received permanent residency status, according to an internal immigration services document obtained by the AP that outlines background information about the firm; the name of the investor was not disclosed. the new electric MyCar in 2012 in Horn Lake, Miss. Simone Williams of GreenTech said "every one of our first two rounds of EB-5 investors was approved and their investment was released to GreenTech Automotive." But she did not provide the number of investors. She said the government's pace in approving foreign investors has slowed down plans to start construction at its Tunica County facility. Christopher Bentley, spokesman for immigration services, said in an email he couldn't comment on details on the plans by GreenTech and Gulf Coast Funds. In May, the SEC subpoenaed unspecified documents from GreenTech and banking records from Gulf Coast, according to nearly 100 pages of documents recently released by Sen. Charles Grassley, R-Iowa. The documents indicate GreenTech allegedly improperly guaranteed investors returns on their money. GreenTech has acknowledged receiving the subpoenas and said the company is cooperating with investigators. The Department of Homeland Security inspector general also is investigating allegations that USCIS director Alejandro Mayorkas— President Barack Obama's pick for the No. 2 slot at DHS — used his influence to help Gulf Coast obtain a foreign investor visa for a Chinese executive. Since the 2009 groundbreaking, GreenTech has changed its business plan. Instead of producing versions of the four prototypes it showcased then, including hybrid cars, it now says its plant, when built, will have the capacity to make 30,000 electric vehicles each year, including a sedan and small electric vehicles known as MyCars. It now aims to have the first ones rolling off the line in Tunica by April. In the meantime, GreenTech has been using space at an old elevator factory in Horn Lake, Miss., where the company says it's building MyCars, neighborhood electric cars that are a cross between a golf cart and a full-sized vehicle. It's not clear how many of the MyCars — which are not legal to drive on U.S. highways — have been sold. A satellite office of GreenTech Automotive is adjacent to two cash lending bueinesses in Tunica, Miss. GreenTech recently declined an AP request to tour the Horn Lake facility. The company won't say how many MyCars it has produced or sold, but says it has "international distribution agreements for 30,000 vehicles over the next three years." Local officials haven't lost hope it will all still happen as advertised. "I still look at this as an ongoing economic development project," said Lyn Arnold, president and CEO of the Tunica County Chamber of Commerce. Some residents are ready to see results, like 33-year-old waitress Shaquita Pickett, who said a car plant would be a big boost for the county. "We really do need one here because we need better jobs," she said.